Before I Say Good-Bye, We Need to Talk about Kevin. He is Forever Odd and Absolutely Nuts. In fact has gone Far beyond the Dead End. F? @k Knows (which means, I don’t know), is The Helpline, the answer? Interesting ! You have managed to make sense out of it..
Amazing! Another one of those things (including a Haiku) that I just cannot get the hang of. Haiku is not my cup of tea too! Spine Poetry is fun, I think it would be awesome composing in a library or a book store! I love the idea of spine poetry! This is lovely and it must be difficult to collect the right titles and then compose poetry or make a sentence. 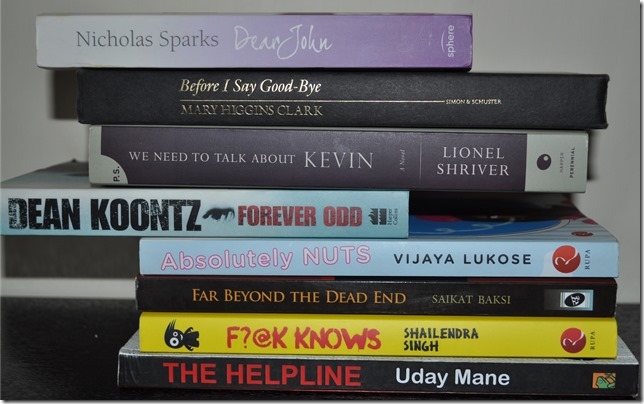 I love spine poetry, was introduced to it during the AtoZ blog challenge a couple of years ago. Loved yours too. very creative, i must try this once. This is the first time I came across book spine poetry. I looked through your other posts on this and truly loved the way you compose each time. Am glad you liked the spine poetry here, Uma! nice , i didnt know about spine poetry till now!